Junk thoughts belong where junk goes: The trash (or recycling). 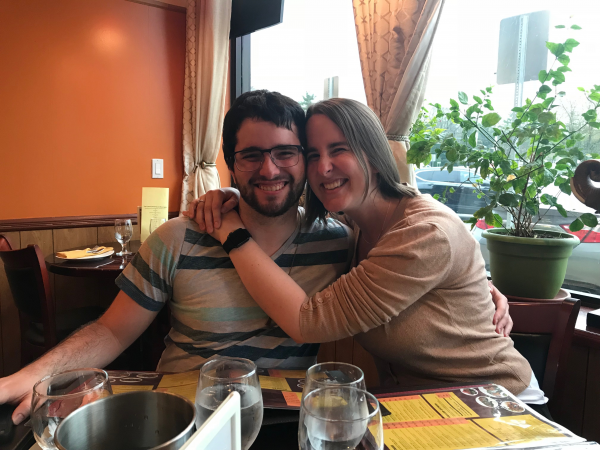 This is by far the healthiest relationship I’ve ever had the privilege of sharing with someone. We are partners through and through – equality in all things. We’re living out the biblical call to outdo one another in showing honor, and it feels right. However, that doesn’t mean old and unproductive thoughts from past relationships don’t crop up here and there – thoughts and lessons that have little to no relevance to my day-to-day sweet moments with him. 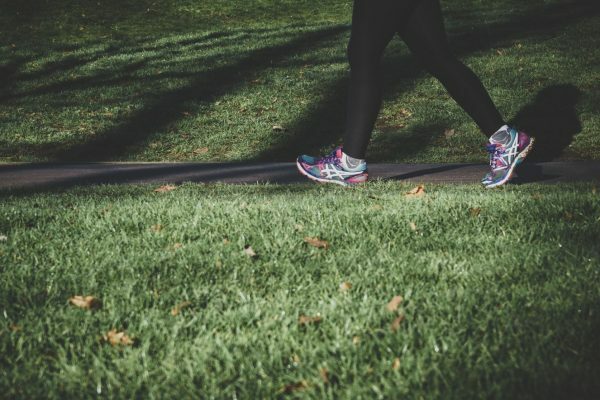 In some instances, it’s like the 24-year-old me who’s self-assured and knows that her home is in herself and in God, not in another person, disappears and the 17-year-old or 22-year-old who had unhealthy boundaries and low self-esteem crop up. They seem to crop up to remind me of lessons that I’ve learned – good and bad alike – from past relationships, as if I’m going to forget and make the same mistakes. As if I’d never learned at all. This is a real thing, right? We all try to learn from our pasts – those who forget them are doomed to repeat them, after all. But not all of what we have learned is real or helpful. If some of the “lessons” I learned was that I’m not good enough/I’m not enough or, conversely, that I’m too much, how can these possibly be helpful? They just bore a hole in my soul. I nearly cried as I wrote all of the terrible things that I was carrying in my heart – everything from “I need to be the perfect partner” to “talking about my feelings with my partner is showing weakness, makes me needy, and they’ll blame them on me and leave me” to “my health problems make me a heavy burden” to “I am an object to be used rather than a person to be cherished.” Wow. These words deserved to be burned because I know that nothing about them is true. Some of the lessons have partial truths in them, but some have nothing in them besides hurt, fear, and shame. My office may or may not have smelled like s’mores for the next day or two, but boy, was it worth it. 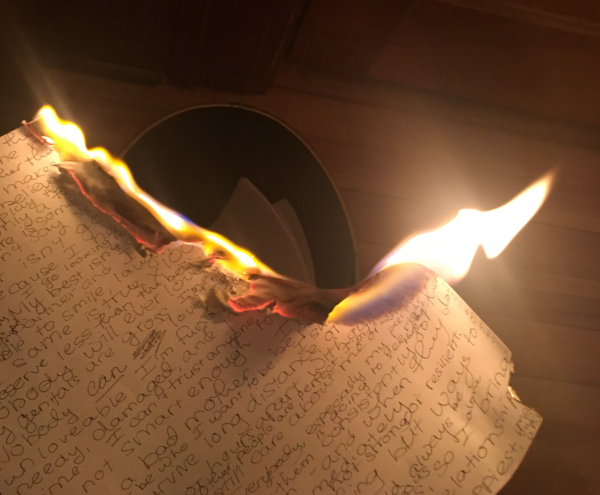 As I burned these awful words, lessons, and thoughts that had been explicitly and implicitly taught to me (or become part of my feelings and eventual self-image), I listened to “Learn to Let Go” by Kesha. Does having this letter and these truths etched in my heart mean that I’ll never feel those old pains again? Of course not. These hurts are also etched into my heart because they have caused me shame and grief. But they’re becoming less visible than the strengths. 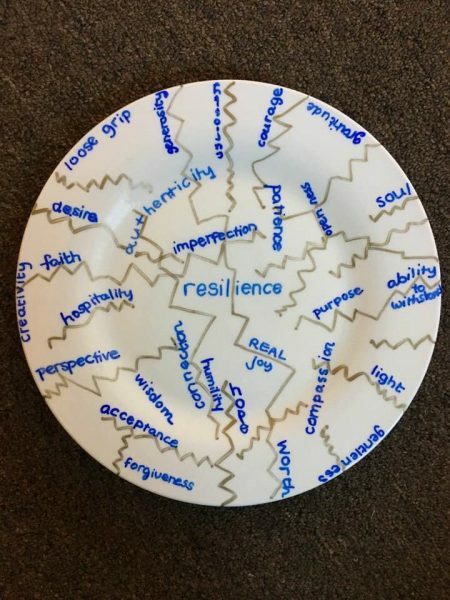 This is a plate I made during a grief group facilitation training that represents so much of who I’ve become – the resilient woman that I am. This is kintsukuroi (金繕い, きんつくろい, “golden repair”), the Japanese art of repairing broken pottery with lacquer dusted or mixed with powdered gold, silver, or platinum. I’m strong at my broken edges, and so are you. But I will not let these old pains overtake the truths about who I am as an individual and as a partner. There were aspects of each of my old relationships that were beautiful and helped me to grow into the person I am now. But these terrible lessons that I learned? May they continue to burn. I don’t need to worry about forgetting them; I won’t. But now, I will work to have them just be memories. 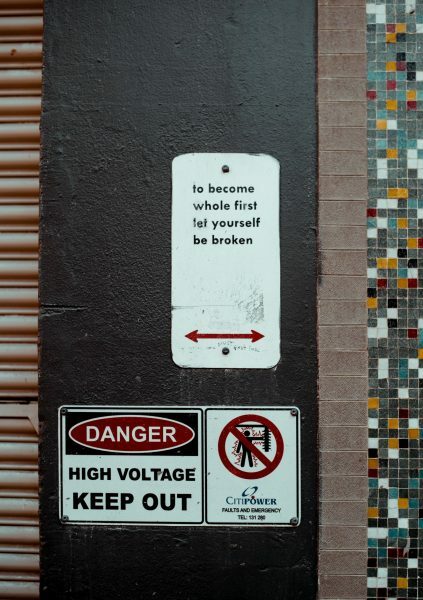 Now, I know that when old feelings crop up, I can say, “I see you, I know where you came from, but I don’t have to believe you and act from this place of hurt.” I can deconstruct and construct once again with self-love and actual truths. I’ll metaphorically burn these thoughts every time I have to. These little fires will be a reminder that I’m healing. Photo by Arek Adeoye on Unsplash. 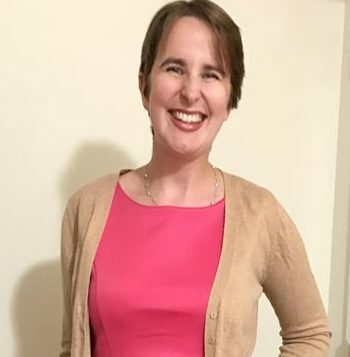 Emmie Arnold is a follower of Jesus, survivor and thriver, graduate student of divinity at Princeton Theological Seminary, blogger at Illness to Wellness, musician, photographer, traveler, goofball, and optimist.